And so it is here -- Rings of Valor 1.0. This is mostly a more balanced and polished version of the previous release. Hopefully no one is too disappointed at the lack of new features. There are quite a few balance tweaks and the whole list can be found again in the changelog below. One thing I'd like to mention is that the AI players now choose their targets bit differently. Due to the change I'm not so good at the game anymore (hah) and I like it. Defender passives no longer simply glue the target on you but the role should still be able to control the fight, to some degree at least. I also learned how libtcod's subcell resolution works and why the credits animation was trying to use seemingly random characters on the sparkly things from my custom font file (before I erased them). And while I was at adding the seven required characters, I made the menu background animation use subcell resolution as well... which results it being quite processor heavy. In fact, my netbook now actually struggles to keep up with the noise generation. But, as always, you can turn the animation off from the settings menu. The background is slightly fancier now, though. When I started this little project early summer, I thought it would be done by the Annual Roguelike Party. I was pretty well prepared; I had a list of all the features I wanted and I had planned the system and all the class abilities. But alas, I didn't "quite" make it. 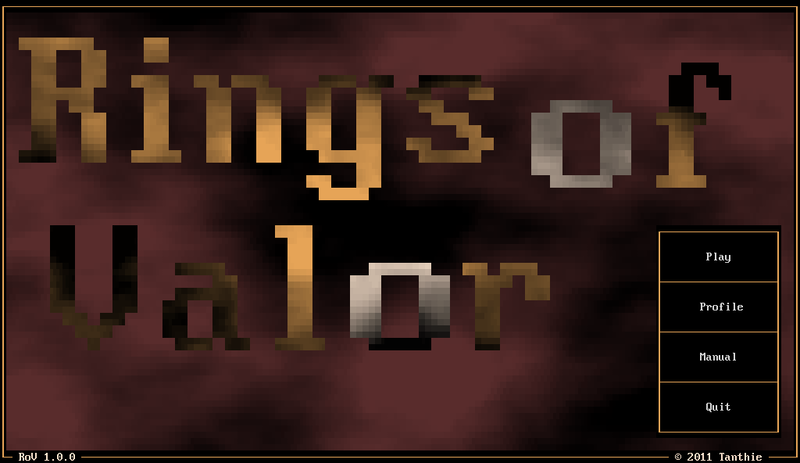 Early on, I also had a misconception that Rings of Valor was a roguelike but that fell off along the way. Still, I'd like to think it's at least like a roguelike and deserves its place at Roguebasin. Also, I became even more familiar with libtcod, though it has still many cool features I haven't touched. My knowledge of C++ grew too and in my next (proper roguelike) project I'm going to avoid many things I totally did wrong with RoV. Mostly I will try to avoid the horrible repetition I tend to do when abstracting something seems too complicated. The source code of the game is about 17.8k lines (not commented) and ability.cpp takes 5.6k of that. It's just terrible. There's a chance of new versions (a very large chance if there are game breaking bugs) but I'd like to move to designing the next project now. You will hear of it when there's something to show. Congrats on hitting v1.0---very much looking forward to your next Roguelike project! This game is cool. I've always been thinking about how someone should make a MOBA style RL. Well done! One thing that would be super helpful is the ability to adjust the game speed. Especially when starting out, the fast pace can make it difficult to learn the ropes.